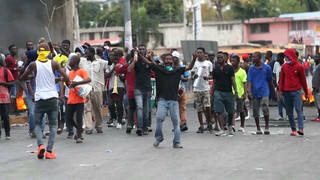 Day of Protest Decries Deaths in Haiti | Democracy Now! We go first to Haiti, where violence continues to wrack the capital of Port-au-Prince. More than 700 people have been killed since September. Today a coordinated day of protest is planned to condemn the July 6th UN raid on Cite Soleil, which may have left as many as 23 Haitian civilians dead. The protests in Brazil and ten North American cities follows a demonstration by more than 5,000 people in City Soleil last week. Also this week, prominent political leader Father Gerard Jean-Juste was detained by police and falsely accused of bringing weapons, bombs and money for mercenaries back to Haiti from Miami. Father Jean-Juste is a prominent leader in ousted president Jean-Bertrand Aristide’s Lavalas party. Lavalas is calling for a boycott of upcoming elections unless Aristide is allowed to return from exile in South Africa. This comes as a U.S.-backed advisory council that oversees Haiti’s interim government recommended Saturday that Lavalas be barred from upcoming elections, accusing the party of encouraging violence. And last week, journalist Jacques Roche, cultural editor with the daily Le Matin, was kidnapped and murdered. Some are pinning the murder on Lavalas forces. Father Gerard Jean-Juste, Roman Catholic priest in Haiti and possible Lavalas presidential candidate. Speaking from Port-au-Prince. More information on the protests at Haiti Action Committee. AMY GOODMAN: We are joined now on the phone by Father Gerard Jean-Juste. He’s attending the funeral of Jacques Roche. Also on the line Bill Quigley, a volunteer attorney with the Institute for Justice and Democracy in Haiti. And next in the broadcast we are going to be speaking with David Zirin, he has written the book, What’s My Name, Fool? : Sports and Resistance in the United States, and we’ll remember Farouk Abdel-Muhti, a Palestinian activist who died a year ago today. We turn now to Port-au-Prince to Father Jean-Juste, on the phone. Welcome to Democracy Now! FATHER GERARD JEAN-JUSTE: Thank you very much, Amy. Good morning to you. Good morning to everyone. And as you said, I am in Port-au-Prince in the middle of struggle, but with the help of God we are surviving and providing [inaudible] services [inaudible]. AMY GOODMAN: Father Jean-Juste, can you describe what happened to you when you returned to Haiti last Friday? FATHER GERARD JEAN-JUSTE: There was a radio station in Miami where somebody has rented an hour on the radio program on the radio. And then they were accusing me falsely, saying that I’m transporting bombs and ammunition and also big sum of money to Haiti. And as I arrive at the airport about to board the plane, they called upon me, and then I saw three agents who came and demand that I be searched. So they stopped me. And as I’m talking to you [inaudible] I’m driving, and the police is [inaudible] me, and so [inaudible] difficult. So they stopped me. They searched me, and they searched my bags that was already on the plane. Then they let the plane leave for Haiti, and arriving in Haiti that Friday the 15th of July, arriving in Haiti by 1:30, finally. And I found security posted everywhere. And then I went to customs again, Haitian customs, and they searched all my luggages, everything. And after I went through all the search and as I was setting out to go home, and then a policeman approached me and said that they want me to come with them to go to the — to where they have the police station by the airport. So that’s where I went. Yeah, that’s where I went, and I stayed until, I think it was about 4:00, and I left there by 6:00. They wanted to question me about many things, and then finally I said to them, “Hey, listen, I have a service at 4:30 and have another one at 7:30, and I’m not going to answer any questions today,” after I identified myself and said everything about where I’m coming from, but “any question regarding any [inaudible]. I’m not going to answer anything.” And then as they understand that I was not going to talk, they called a chief and the chief asked them to make me fill the form that I’m not going to answer and they could take another appointment with me. And so, that’s what was done, and they let me go home by 6:00. And then I returned to the police station, but this time the headquarters, because this [inaudible] central direction [inaudible] judiciary police. And they made me wait from 10:00 to 11:30 in a hot room with bright lights on my head without [inaudible] in the room with one chair. And by 11:30 the chief came and said, “Hey, we don’t have any questions for you right now. You go home, and then we’ll write you when we need you again.” And so, that was it. And meanwhile I got a warning from a in charge to be present at the court Wednesday, July 20. So I went to the court yesterday. They interrogate me for about two hours, from 9:30 to 11:30, and the judge took all these [inaudible] instruction and let me go and [inaudible] said be ready. Whenever they need me, they will call upon me again. So this is where I am. Everybody want a piece of me and keeping me harassed, and then I’m persecuted, and threats coming from all over. And meanwhile, I have been very busy helping the kids in my neighborhood to have a nice summer, thanks to many friends who have helped me about that. So right now, today I’m on my way to attend the funeral of Jacques Roche, a prominent journalist who had been kidnapped and killed. And I’m going to show myself because his parents are from my town, and at a certain time, one of his relatives saved my life. I was being attacked by a mob, and then Mrs. Roche came out, saw me, and get me off the gangs and sheltered me at her house. So this is why I feel that I should be there regardless that they keep accusing Lavalas people of participating in the killings. None of us — no Lavalas — has responsibility, in my point of view. So what’s going on now? We become the scapegoat. Whatever happens in this country, they put it on the back of Lavalas. And so this is a wrong thinking that is very dangerous. They want to get rid of Lavalas, and so anything, they blame Lavalas. So I think enough is enough. If we want peace in this country, if we want a return to democracy, it’s not the way for the official to operate? They should let the justice system make its way by going to investigation, find the proper criminal element, and then bring the criminal element to justice. Yesterday there was a kidnapping. They found a guy, about a light-skinned guy, who was involved, and they didn’t even let us see his face. They covered his face at the airport, and we only see the white feet on the television. And then, so far we have no instruction on this accused person. So that’s the way it is. There are some people, they are being aimed at, they are being persecuted, they’re being targeted. And others, regardless that they caught them in the pudding, they try to protect them. So this is a double standard, and we wish that this will — this persecution of Lavalas will stop. The sooner the better. And bring the constitutional — let’s return to constitutional order, because in my point of view, the president, the de facto president Boniface, the de facto prime minister Gerard Latortue, they’re all criminal, because they have been taking the power with violence and with [inaudible] within the international community, with a silent killing, police destroying institutional goods, destroying the state goods [inaudible]. They are all criminal. They are the ones who should be brought to justice, and free all of the political prisoners, especially the legal prime minister, Yvon Neptune. AMY GOODMAN: Father Jean-Juste, I want to thank you for being with us. One last quick question: today there are protests in a number of cities in North America, from Brazil to the United States to Canada, for the killings in Cite Soleil last week. On Democracy Now! we had a report about the U.N. troops moving in. What is the aftermath, and are there protests today in Haiti? FATHER GERARD JEAN-JUSTE: We protested yesterday. And today, as the funeral is taking place, I think the funeral will take the lead and in honor of Jacques Roche, we are not going to protest in the street today. There will be a protest today organized by the journalists [inaudible] we are in very good support and we are very grateful to all Haiti friends, Haitian American and all of the other friends of Haitians in U.S., in Canada, in Brazil who are demonstrating. [inaudible] Last Thursday there was one of key demonstration that we had at the consulate, at the Brazilian consulate in Miami. Since after persecution has increased for me, but this is our right to peacefully demonstrate, and wherever we are, we are going to keep exercise that right. And I hope that everything will go fine for our brothers and sisters who are peacefully demonstrating in the world, and then the message will be clear. We won’t accept massacre from any troops in Haiti, and from police or from the international troops, we won’t accept massacre. They’re massacring the poorest Haitians, and we say no. We should massacre nobody. So in that sense we appreciate very much the pickets and the demonstrations organized all over U.S. and Canada and Brazil. AMY GOODMAN: Thank you very much, Father Jean-Juste. Father Jean-Juste, a Catholic priest in Haiti who was recently detained by Haitian forces. He had been in prison for months without charge, now talking on this day where there is protests throughout North America on the killing of Cite Soleil residents by U.N. troops. Father Jean-Juste, speaking to us from the streets of Port-au-Prince where he said he is driving and being followed now by police.